"There will never be enough blank canvas to fulfill the desire within me to create." Artwork is such an intricate part of a room's design. While I'm all for DIY pieces and black and white family photos, sometimes nothing can do the space justice like a true art piece. One particular artist that I love is Christina Baker. Her paintings go so well with almost any style and have such a softness and fluidity to them. She is excellent at marrying beautiful color combinations with abstract forms and the outcome is nothing short of amazing. She began painting in watercolors with her grandmother, and I love that you can still see that inspiration in her work. Here is one of her recent watercolors. Many of her paintings are available at galleries around Atlanta, GA, but you can follow other available works and her latest paintings on her Facebook page or website. Don't you just want a piece for yourself now? 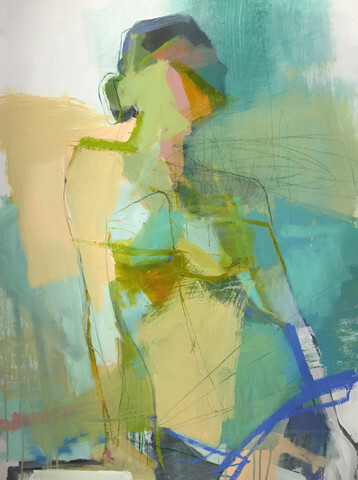 A young talent from Charleston, Teil Duncan is the artist behind these beautiful abstracts and gestural figure paintings. Her paintings consist of lovely color palettes and contain a feminine quality to them. My favorites are from her beach series. Teil's art can be purchased on her website but be warned she sells out fast. Many of her paintings sell for around $1950-$1400. However, she offers a couple affordable prints for $110 such as, the ones below. Gorgeous, no? If there is an artist you think we should know about, share with us. We are always looking for great art.